Army Sgt. Aaron Catlin beat over 400 runners in a BAA-sanctioned “shadow” Boston Marathon at Bagram Air Force Base in Afghanistan on April 14th. 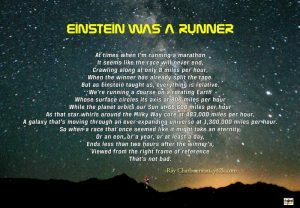 Despite what the narrator says in the video below, the marathon was run over the official distance of 26.2 miles. 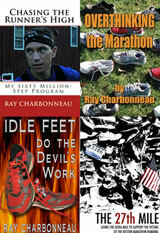 The CO at Bagram must be a runner, as they’ve also shadowed the Air Force Marathon for the past three years. The Olympics take in billions of dollars. All those annoying ads aren’t going anywhere. Why shouldn’t the athletes get a cut of the pie? 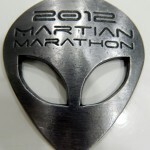 Paul Gentry’s site has pictures of a multitude of marathon medals. 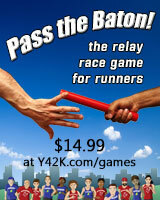 I’d love a medal from the “Too Slow for Boston” Marathon, but the race takes too long. Running barefoot like ancient man isn’t enough for some people. Kenichi Ito tries to devolve further and run like a chimpanzee.